Well, the forecast looked mixed again in Washington, while as usual sunny skies prevailed far to the south. 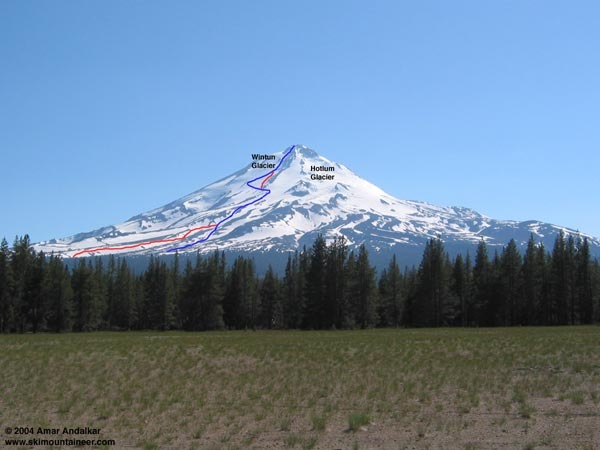 Time for another trip to the king of the southern Cascades, Mount Shasta, to ski the east-facing Hotlum-Wintun Ridge, one of the finest and most direct summit ski routes in the entire range. The Fifth Season climbing report (530-926-5555) stated that ski conditions remained good on this route, while other routes were much more suncupped. David Coleman and I headed south from Seattle on Friday morning under cloudy skies, eventually breaking out into full sunshine in southern Oregon. The road had finally opened all the way to the Brewer Creek trailhead just days before, and we started hiking up the trail just before 6pm. We reached skiable snow by 7800 ft and skinned up directly towards the ridge. The snow surface was heavily suncupped, with craters 3-5 ft across and 1-2 ft deep, but skinning was still easy on the softened but completely-consolidated snow. We skinned up to 10200 ft to reach nice campsites on bare ground beside the snowfields, and enjoyed a fine sunset as the triangular shadow of Shasta stretched itself across the empty wilds of northeastern California. Winds built steadily during the night, eventually reaching an objectionable level by dawn. Abandoning plans for an early start, we stayed in our bivy sacks an extra hour until the winds began to calm. We finally left camp at 7:30am, leaving the skins behind and simply cramponing up the solidly frozen snow. We angled left through a snowy gap in the mostly bare ridge at 11200 ft to reach the Wintun Glacier, and followed a zigzag line up the 30-35 degree crevasse-free face. Open cracks and seracs could be seen farther left (south) on the Wintun, but this glacier is generally safe for unroped travel along its northern edge. Our pace slowed greatly in the thinning air, but eventually a decent bootpack of steps was reached above 12500 ft. Occasional patches of water/glacier ice were interspersed among the snow near 13500 ft in the main chute. Clouds were building below along the east slopes, often completely obscuring areas below 13000 ft, but never rising to the summit region. Reached the summit at 1pm, to find a circus of 20-30 climbers who had come up the opposite side via Avalanche Gulch, with traffic coming and going constantly. A party of 6 even showed up via Hotlum Headwall. Temps were quite warm, close to freezing, with an occasionally gusty SW wind. Skied directly from the east edge of the summit block (about 14140 ft) at 1:15pm. Snow conditions above 13500 ft were tough, firm and crusty, really quite nasty, but softening into a skiable corn-like surface below. Only two other skiers were on the route that day, both still climbing up. The Wintun Glacier was much more heavily runneled and suncupped than expected, and ski conditions were quite mixed, with some smooth areas of nice soft corn but mostly somewhat bumpy. Occasional whiteout in the shifting cumulus pressed against the eastern slopes added some challenge. The skiing was slow and bouncy down to camp at 10200 ft (where skies were clear), and even worse below that with the added weight of heavy packs. At 9000 ft, we angled right (away from our ascent route) to the smoother slopes along the northern face of the main Hotlum-Wintun Ridge. Here we found the best skiing of the day, with a smooth surface of nice corn and minimal suncups. Lots of ski tracks and several skiers could be seen below, they had come just to ski the lower slopes and not to summit. We skied down to 7650 ft in the main gully, but skiable snow extended several hundred feet lower with a couple of carries. A quick traverse north on foot across several gullies brought us back to the Brewer Creek trail. Overall, the snow conditions were more like late July than June, but coverage is still good and the route offers 6500 vertical ft of continuous skiing from the summit block. The other sides of the summit block are mostly bare, so the Hotlum-Wintun is the only way to ski from the summit of Shasta right now. Despite the mixed bag of snow conditions, it was fine trip on a great route and quite satisfying to ski my fourth different route from the summit of Shasta this year. See the previous reports (Avalanche Gulch / Red Banks, Hotlum-Bolam Ridge/Glacier, and Clear Creek Wintun/Watkins Glaciers) for more info. This photo shows the northeast side of Shasta from the Military Pass Road. The upper part of the ascent route is shown in blue, with the ski descent shown in red where it differs from the ascent route. Click here for an enlarged version of this photo. Wow, you are one motivated dude - shasta four times in a year. Yow. I can't even contemplate doing the drive to Shasta that often in a year. My prediction for the future of H-W based on my June 11 run was that yes, coverage wise it would be skiable for at least another month, but that large quantities wouldn't exactly be the kind of snow sought out for skiing. Seems like you bore this out. This based on what the snow surface was looking like June 11 between 8-11K and particularly how it was suncupping (and getting a ton of random boot trackage) even despite remnants of fresh snow from 2 weeks prior.